THERE ARE OVER 3,300 children homeless in Ireland, latest figures show. The figures for homeless people staying in emergency accommodation in November have been released this evening, showing a rise in the number of homeless families and children yet again. There were 5,524 homeless adults in emergency accommodation in November, a rise of 226 on the month previous. “Obviously the increase in November is disappointing. But, for individuals, it does mean that more rough sleepers are now engaged with our services. We were anticipating an increase in the number of homeless adults recorded in November because we have been bringing new bed-spaces on-line as part of both our cold weather initiative and the opening of new facilities as promised. Speaking to TheJournal.ie this evening, Sinn Féin TD Eoin Ó Broin was highly critical of the government’s action to tackle the ever-growing crisis of homelessness in Ireland. “These are deeply, deeply depressing figures. They show significant increases in adult and child homelessness,” Ó Broin said. “What is also very significant about these figures is there are very different figures in Dublin since last month,” he said. 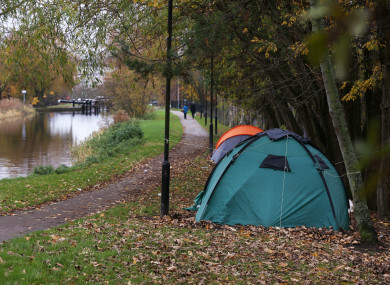 A total of 3,691 people were recorded as homeless in Dublin in November. This was an increase of 155 in October. Noting the comments of Murphy from previous months and taking November’s figures into account, Ó Broin said: “What this shows today is that the government strategy on tackling the homeless crisis is failing utterly. Particularly given that it is Christmas, Murphy has two choices – he has to address his approach to tackling the crisis or he has to consider his position. Yesterday, the Simons Communities of Ireland said that there was an increase of 33% in the number of people seeking its help last year, according to figures published in its 2016 annual report. The homelessness charity recorded increases in access to its services across the board as just over 11,000 people came to it looking for assistance. For example, this is almost enough people to fill to reach the capacity of the 3Arena, which can fit 13,000. This included 1,417 families with 2,860 children. That number is closely linked to the current homelessness figures, with 5,000 adults and over 3,000 children set to spend Christmas in emergency accommodation. With such a large increase in the numbers accessing services from the Simon Communities, its national spokesperson Niamh Randall said that 2017 has seen the problems continue to worsen. Randall said that the government’s policy to tackle the homelessness problem to date has not worked, and it can and must do better in 2018. She added: “We need the State, in conjunction with Local Authority and Approved Housing Bodies, to build social and affordable housing across all tenure types within sustainable communities nationwide; to prevent more people from becoming homeless; and to address the complex or multiple needs that can be a cause or consequence of homelessness. The New Year will ring in with more than 5,000 adults and 3,000 children living in emergency accommodation, with many more trapped in housing insecurity and hidden in doorways and squats across our towns and cities…. this is not acceptable for any man, woman or child in Ireland in 2018. Email “'It's deeply, deeply depressing': There are still over 3,300 children homeless in Ireland”. Feedback on “'It's deeply, deeply depressing': There are still over 3,300 children homeless in Ireland”.